She turned 26 on Friday, and on Thursday she had a fun party with her family. 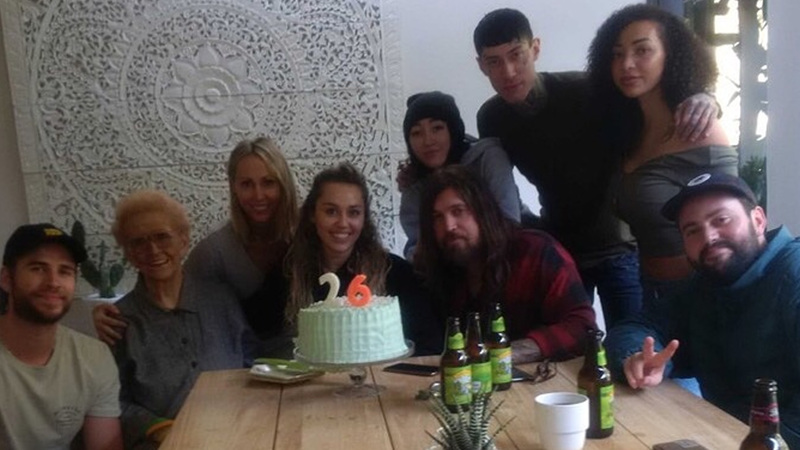 Her dad Billy Ray shared a photo with Miley, Tish, Noah and Trace Cyrus as well as Miley’s love Liam Hemsworth. They all beam at the camera while a cake sits in from the of the pop star with “26” candles on top. “Thankful for this moment. My thoughts and prayers with so many hearts that need mended. Peace and love to all,” he wrote. The “Wrecking Ball” singer’s birthday comes after a tough month for her and Liam. They tragically lost their home in the Woolsey fire in Malibu. Liam shared a sad photo of their burnt down home on Nov. 13. “I love you Malibu. Thank you to all the hero firefighters around California. It’s going to be a journey to rebuild. Stay strong all,” he added. Miley and Liam went on to donate $500K to the Malibu fire relief efforts.